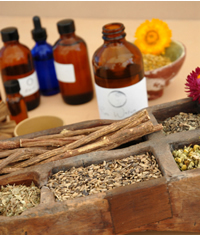 Medicinal Oils can be used alone, or can form the basis of salves and balms. The general principal is simple: Oil + heat + herbs = Herbal Oil. The most versatile and easy system for measurements is the simpler's method, because it is based on ratios, measurements are referred to as "parts", for instance 1 parts dried herb to 5 parts oil is very common ratio used in herbal oils. The quality and strength of your homemade herbal oils depends not so much on exact measurements, as it does on making sure you cover all the plant matter, so no spoilage occurs. There can so much variation in the strength of herbs (due to growing and harvesting conditions, fresh or dried, etc.) that each batch will still be slightly different. In my experience, the length of time the oil macerates, and the amount of heat applied are the biggest determining factors in how strong your oil becomes. Using a very high quality organic oil such virgin olive oil, or safflower oil, is as just as important as the quality of the herbs used. You will find that making herbal oils and other preparations is not an exact science, and each batch is always a learning opportunity. Mountain Rose is my supplier of choice for all bulk oils and herbs that I do not grow myself or obtain from local organic farmers. 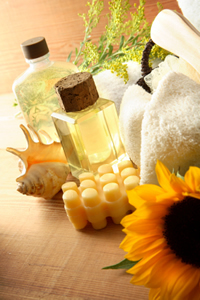 Homemade herbal oils are fresher, contain no chemical preservatives, and save loads of money. All of The following methods can be used, the one you choose depends on how strong you want your oil to be, and how much time you have to make it. Solar infusion: Using the 'simplers' measure, place the herbs and oil in a glass jar and cover tightly. Place in a warm,sunny window and let infuse for about 2 weeks. Add one tablespoon of apple cider vinegar or white wine to help break down the plant material. Strain and rebottle. For a stronger oil, add a fresh batch of herbs and let infuse for two more weeks. Oven Extraction: Place the herbs and oil in a canning jar, or a container with a tight fitting lid. Put them in a pan with enough water to cover the bottom half of the jar. Turn the oven on the lowest temperature possible and heat for several hours. This is a good method for those days when you are going to be around the house all day. I have better luck with this than the faster double boiler method, because the oil doesn't tend to overheat, and you don't have to watch it so carefully. Double boiler method. Place herbs and oil in a double boiler ,covered with a tightly fitting lid and bring to a slow simmer. SLOWLY heat for 1/2 hour to an hour, checking frequently to make sure oil is not overheating. The lower the heat and longer the infusion time the better quality of oil. Crockpot method. Place herbs and oils in crockpot and set on lowest possible heat. You will have to experiment with your own crockpot as the strength of the heating element can vary quite a bit, but as a general rule 2 to 4 hours will do it. (my crockpot is just too hot for this method) Electric roasters have an even lower heat source and herbal oils can be left to steep for 2 weeks. Once the herbs have been infused into the oil, strain the mixture, bring to room temperature. You may then add a few drops of essential oils such as lemon, or rosemary for even more stimulating properties as well as a nice fresh scent. Rebottle and enjoy.